Have you witness another player breaking the rules? Find out how to tell us. The best way to handle players that you find irritable or rude is to add them to your Ignore List or adjust your chat settings so you're no longer bothered by them. On rare occasions, when a player's behaviour has escalated or persisted beyond simple trolling, you have the reporting tool at your disposal. What does the report tool do? The reporting tool sends a snapshot of in-game chat to us. We will then look over the report and take any necessary action. Click the Report a Player button in top right corner of the All Chat interface. Select the chat or player you wish to report and press 'next'. 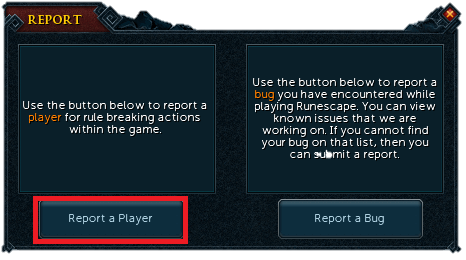 Select a reason for reporting the player. Choose to temporarily ignore the player or not. What if the player is breaking multiple rules at the time? You only need to submit one abuse report for an incident. We can get all the information we need from a single report. What if their offence isn't available as an option? If you are not sure which rule to choose, choose which ever rule you think is the best fit, our Player Support team will still know how to handle your report. When should I submit the report? As soon as the offence has occurred. A report will only contain the in-game chat that took place at the time it is sent, so you shouldn't wait to discuss the matter with someone. If you wait then it may be too late! You can always talk to someone about the incident after you've sent the report. How will I know my report has been reviewed?